On the quiet side of Cape Cod, a good-natured ecumenical community lives, worships and, in the mode of Benedict, glorifies God in music and art. Surrounded by vernacular white-shingled living quarters in Orleans stands the Church of the Transfiguration, an imposing moderno-Byzantine basilica which William Rawn designed before becoming famous for Ozawa Hall. The 120-ft-long sanctuary is graced with stone carvings, glittering mosaics, and a gargantuan organ whose pipe chambers run the length of the nave. Gloriæ Dei Cantores, a chorus drawn from the religious community (and this is no ordinary community and no ordinary community chorus), arrayed itself behind a well-booked freelance orchestra in the theatrically lighted apse in order to offer up a sumptuously sounded Elijah. But here’s the buried lede: there was a considerable amount to like about this community’s take on the oratorio. Let’s start with the chorus. The 40 sisters, brothers, and residents have in 25 years produced 50 CDs, attaining a level of execution that volunteer choruses from secular communities can only dream of. The sound was warm and articulate, never harsh or forced. They remained fresh to the end. Pitch and unanimity never failed, even though hard consonants and sibilants sometimes stuttered. If Gloriæ Dei Cantores did not quite pour forth the volume of tone able to equal an orchestra of 52 and the immersive 150-rank Skinner+ organ in partial cry, and if they rather lacked the pagan abandon of Baal worshipers, they nonetheless produced inspired, moving impersonations of angels, and were convincing as voces populi. “Cast Thy Burden…”, intended for angelic solo quartet and here done by full chorus, showed discipline and shaping allowing 40 to sound like four. Nuance, textural commitment, and consolation were notably evident in that number. We also enjoyed organist David Chalmers’s management of a part not usually not included in Elijah performances. Providing just the right underlining and emphasis, the organ’s role was apparently derived from the improvisations of Henry Gauntlett at the premiere. Mendelssohn loved organs, having near the time of Elijah written six major sonatas in short order, so it’s a subject of debate as to why he apparently failed to include the organ in the oratorio’s urtext. An interesting essay is here. The well-chosen orchestra of Cape and Boston freelancers followed the Biblical dictate to “Be not afraid.” They were dependably well-tuned and generally tight of ensemble, though they failed to rise to the status of a character in the narrative. This may have been due to the beaty, decidedly un-improvisatory conducting of Richard Pugsley. To be fair, understand that this was the final rehearsal of a piece apparently new to many of the players. And there still were gorgeous moments such as the cello section’s big tune in “It is enough,” which evoked “Es ist vollbracht.” One can assume that Friday’s and Saturday’s performances will offer more surprises and contrasts. Baal worshipers should not sound like Hebrews, and do we really need to see fixed smiles on the choristers? The three women soloists sounded unexciting in this preparatory reading; the fave trio “Lift Thine Eyes” fell flat, voices ill-matched, lacking in wonder, one wandering north of true pitch. As Ahab, Obadiah, and soloist, redoubtable tenor Limmie Pulliam, large of stature and stentorian of tone, projected ringing avowals in clear German. Of course there’s no reason to offer this oratorio without the services of a vivid and authoritative titulaire. In bass-baritone Andrew Nolen we had a trump of fame sounding the Lord’s call. The tall, ascetic prophet demonstrated total commitment in torrents of tone. He acted compellingly as well through an evocative countenance. With pleasure I would open the door for him next Passover. Performances of Elijah continue Friday and Saturday nights, and there is every possibility that by Saturday night it will be amazing. The organ as installed, restored, and augmented by Nelson Barden can be heard on Friday afternoons as part of the regular 3:00 tour. A concert of organ and brass comes next Friday and Saturday. 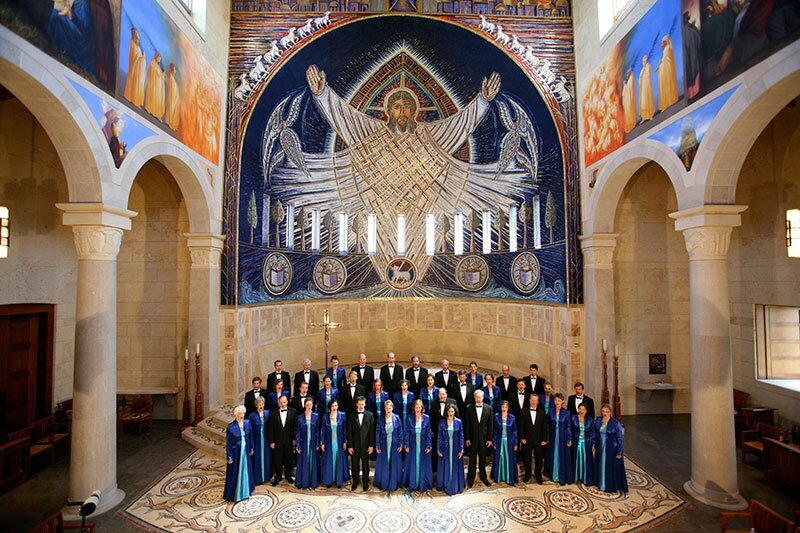 More on this impressive and unusual choir and its many recordings can be found here. Delightful to know about this radiant Benedictine community and church on the Cape. John Ruskin would have loved it. Robert Lowell might have cited it in verse. New England is so rich with what we might call experimental traditionalism — with roots in Brooks Farm and other poetic initiatives. It provides a sort of invisible context for the flourishing of music. Thank you for such an evocative description of Elijah’s sufi-spirit among us. The Community of Jesus in Orleans may not be so radiant, however fine its music. It has often been called a cult. While its public image is very different, former members report the harsh methods of thought control that characterize cults, including both psychological and physical abuse. Its members are said to take vows of lifetime obedience to its primary leaders, who maintain control. The allegations, occurring over decades, are ugly. There are painful accounts of small children being punished, and the separation of children from parents. Community leaders have historically denied all such allegations. Anyone who wishes to explore this subject need only Google them, and start reading. A brief article in Wikipedia lists three of the websites that contain some of the descriptions, much of it from former members.